~Manchester might be home to the trippy ‘madchester’ scene of the 80’s and 90’s but aside from music, art is another creative realm it’s inhabitants feel strongly about. In particular print based products. Preston has recently refurbished an old building on GuildHall Street into a cultural hubbub for artists to frequent. Simply called ’The People’s Production Lab’ it has garnered attention for it’s ability to store creative events and promote local artists. 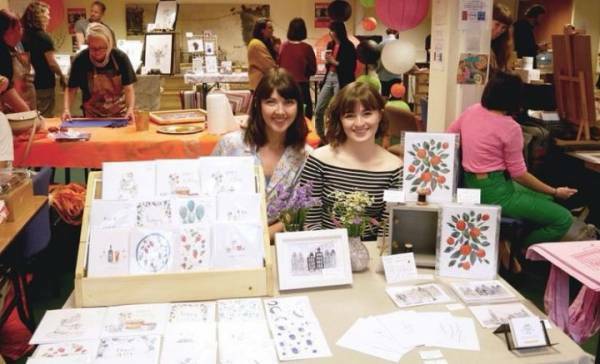 Now the two are combining to bring the Manchester Print Fair to this exciting place which has increased in popularity to become one of the country’s biggest print fairs. It is scheduled to take place this Saturday 15th September between 10.30am - 4.30pm and it’s an opportunity to recognize and appreciate the community’s thriving print based designs. The event is produced by Preston based They Eat Culture who have helped put on a number of events in recent years. Work is also available to buy from local independent makers. Public engagement is encouraged too by means house printing and papercraft workshops. Entrance is free and handcrafted printed gifts and homewares will be available on display. Drinks are available from the PPL bar within the venue, which spans Guildhall Street and Cannon Street. Artists Tom Cockeram and Kim Graham are curating a number of printing and papercraft workshops throughout the day. Please look out for them and show your genuine interest by your kind response to their work. This is one of four events across the '100 Days to build TPP' programme. Attend as many as you can and if you’re a creative person yourself why not invest some time in how you can get involved with The People’s Production Lab. You can find more information about this event by visiting the face book page :- ‘Manchester Print Fair Coming to Preston’. Guildhall Street - Canon Street - Preston - Lancashire.